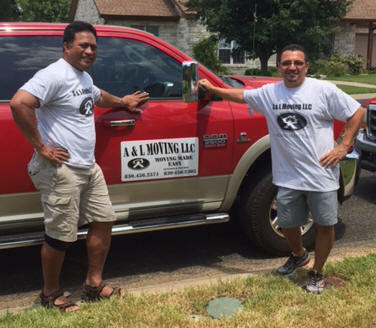 Whether you're looking for a local Texas Hill Country Moving Company or a Long Distance Moving Company, A & L Moving LLC is on hand, ready to assist 7 DAYS A WEEK. Our business was founded on the principle that customers deserve to work with a moving service that actually cares about its customers, and most importantly, treats customers and their valuables with respect. We are working hard to preserve and build an excellent reputation, and are constantly trying to improve and optimize our services. We are driven by our values – At the heart of our business is the idea that customers deserve a Fredericksburg TX mover that is punctual, reliable, hardworking and friendly during all stages of the job. Fully licensed and insured - While we've never had a damage claim, we have the proper licenses and insurance policies in place to make sure we've got you covered if something is damaged while we're on the job. Great service, no hassles - Our job is to make your moving experience easier, so we work diligently and efficiently to help pack up your life, load your belongings into our trucks, and then unload everything safely into your new home. We promise to communicate with you if we have recommendations about how to properly pack. Employees screened before hire - We screen all potential employees thoroughly so our customers can rest assured that we are committed to building a business and not just offering a service. Follow up after the move - Even after the bill is signed and we have departed your new home, you are never on your own. You will receive a follow up call from A & L MOVING LLC so you can let us know if you have any concerns about your move or if you need additional services, such as unpacking or hauling away your used boxes and packing material. Most importantly, we want to know how everything went so we can ensure you are not only satisfied, but delighted enough to become a customer for life - and hopefully tell your friends and family about us too! We're not your run-of-the-mill moving company, and our team of South Texas movers is always ready and willing to help with any size job. We are dedicated to changing the way people look at the moving industry by providing straightforward, reliable moving services. Customer satisfaction is a key component of our business and we're proud of that.